Spread the sweetened coconut flakes on a small baking sheet, sprinkle with the salt and cinnamon, and mix and spread again. Bake 7 to 8 minutes, or until the coconut flakes barely begin to toast (don't let them brown entirely). They should be slightly crisp and still chewy. Remove from the oven and immediately transfer to a small bowl. Pour the coconut milk and sweetened condensed milk into a medium saucepan. In a small bowl, mix the cornstarch with the regular milk and stir until completely dissolved. Pour it into the pan with the coconut milk and sweetened condensed milk. Place the saucepan over medium heat and cook, stirring continuously, until the mixture begins to simmer and thicken, about 8 to 10 minutes, until it coats the back of a wooden spoon. Remove from heat. 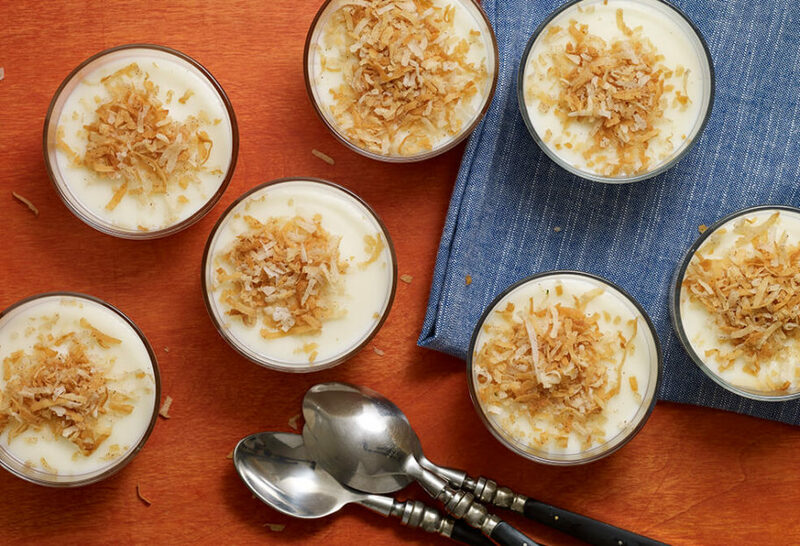 Immediately ladle into custard bowls or ramekins, sprinkle with the toasted coconut. Serve warm right away. Or serve cold later on by letting cool completely, then covering with plastic wrap and chilling in the refrigerator for a couple of hours. Just made the cream De Coco and it came out extremely thick after 4 minutes. I didn’t have corn starch so I used potato starch (which we use in Germany). Could that be the reason? Yes, for sure, it was probably the potato starch – as it is a different ingredient. You may want to use less and cook for less time as well, Lydia. Hi Pati my granddaughter and I tired your recipe and it was AMAZING!!!!!!!!!! I’m so glad you guys liked it, Hortence! Say hi to your granddaughter for me. I made this and it was delicious. Even the picky kids who “don’t like coconut” really liked it! Can’t do better than that. So glad all the kids love it, TJ! The Crema de coco was so easy to make. What brand of coconut milk did you use? I may have used one that’s not up to par in taste. There’s an after taste that’s left. I’m sure I bought the wrong one. Oh I’m sorry to hear this. I recommend you experiment with the different brands you have at your local store to see which you like best. Thanks Pati we love your sjow! It’s a great summer recipe… have a yum summer, Elizabeth! Super! So happy to hear this, Eileen. Hi Pati! I’m trying to find a recipe you did a couple years ago. Coconut eggnog. I made it and my family loved it, but now I can’t find the recipe. Can you help me? I can’t wait till I try it! It sounds like a recipe we have in Dominican Republic and Puerto Rico. Thank you Carmen….enjoy the Crema de Coco! I can’t wait to make this just saw the episode a few minutes ago and had to find it! I’m so excited Thank You Pati!! Awesome! I hope you enjoy it Melissa. Hi patty loved your creama decoco recipe,and Dannys flourless chocolate pecan cake,was so good,I love all your shows,and how you love your family and Mexico! Awesome! I hope you enjoy the recipe. Super rico! We have made it twice now and it is a total hit…the coconut flavor is intense and very satisfying. Gracias por compartir! Hi Pati, I want to make this but I am not sure what kind of coconut milk to use. There are unsweetened, sweetened, and they are quite different. I have both your books and have made several recipes from your show. My friends loved your grilled pineapple drink. As did I. Thank you for sharing your excitement for cooking. I’m so glad the pineapple drink was a hit, and I hope you like this recipe! I use regular coconut milk. Thank you so much Rachelle! I hope you love your cookbook! Love your show and love this recipe. 😋First recipe I tried was pico de guacamole! Love them all! Thank you so much Gloria!!! What if I don’t have small bowls just casserole dishes? What do you recommend? Gracias! You can use a casserole and spoon it in small servings as needed. Enjoy! Se ve riquisima! Definitivamente la tengo que hacer. Gracias por compartir tanto de nuestro bello México. Saludos y muchisimo mas suerte y bendiciones. I am your fan since day one. Love this easiest recipe will try soon. Love You and All the Best for your TV shows. I Did This Recipe Yesterday For Mothers Day , It Was Spectacular , Everyone Absolutely Loved It, It Was Just So Perfectly Creamy. Thank You Soo Much Pati For Sharing With Us. I Loooove Your Show And All Your Recipes!!!! Thank you so much Karina! I hope you and your family had a lovely Mother’s Day. I have been looking for this recipe since I was 6 years old.. yep… my first introduction was in a Swanson Enchilada TV dinner! My favorite dessert ever! I let someone else eat the meal! This recipe took me back! And was obviously much better!! Este postre es delicioso y facil de hacer…Gracias Pati por compartir esta receta.. I made this Crema de Coco today, it was delicious!! So happy you liked it Liz! I was so excited to make this and I followed the recipe exactly and found it to be to bland. It was sweet….maybe even too sweet and not enough “umph”. Even my grand children did not care for it. I don’t know what I did wrong. It was beautiful to look at, but no one wanted to eat it. I’m so sorry to hear this Janice! It may be the brand of coconut milk you used in the recipe. I find that some of the coconut milks available in the grocery store are bland and lack coconut flavor. I would recommend using Aroy-D, Chaokoh, or Trader Joe’s brand coconut milk. It may be worth another try if you used a different brand. What kind of milk do you use for this recipe? 2%? Whole? or does it matter? I recommend using whole milk…but if all you have is 2% it will still turn our delicious! Pati, thanks for sharing your recipes! And congratulations on such a lovely Season 5 that shows so much of the beauty of Mexico! I have watched your program since the beginning and have seen your boys grow up, just like a neighbor or friend. You are so real and warm in your presentations. I love coconut and this is the first recipe from Season 5 that I am going to try. I can almost taste the flavors of this sweet custard dessert. Hey Sylvieann, thank you, thank you. So happy you like Season 5, we are now planning where to go for Season 6! So many places to explore… Thank you for sticking with me since the early seasons… that means a lot. !